Tiny! Cool-looking! When you see the Air Hogs Micro Terrain Titans in person, you just want to have all of them. 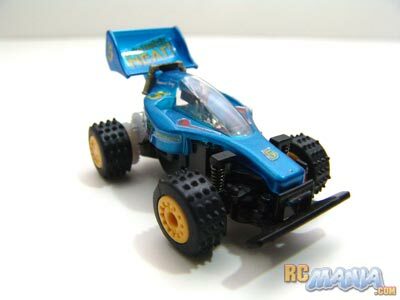 As it turns out, they're designed to mimick the look of some truly legendary normal-sized (well, 1:10th scale) RC offroad buggies made in the early 1980's by one of the top hobby-level RC companies of all time, Tamiya, Inc. A whole assortment of different ones are available with different colors and bodies, but they have the same chassis & motor. The one I got is called the Avante (pronounced "Aw-vawn-tay"). Standard Air Hogs fare here -- the tiny controller takes three AAA batteries and doubles as a charger with a special port on one side. It takes less than a minute to get a full charge. From the moment I started driving the Micro Terrain Titan, I was giddy with excitement, though I thought it was pretty slow. That's when I remembered from the instruction manual that the extra button on the top right corner of the controller, the same one that activates charging mode when the car is attached, puts you into turbo mode (I just like to call it "full speed"). Now I was really having fun! Low speed is good for maintaining careful control to navigate around lots of obstacles, but full speed is just a blast. That trick spring suspension really works. On a makeshift desktop obstacle course, I could drive up small stacks of paper and was even able to jump over a pencil with no ramp. 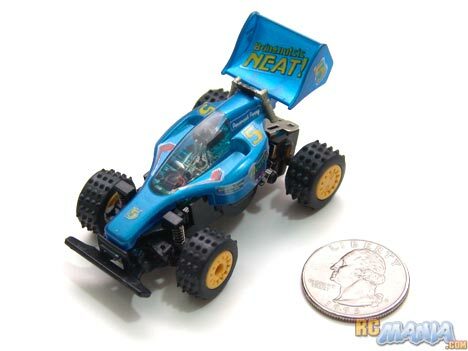 It could even drive right over the keys of my full-size keyboard without any trouble. It went pretty long on one charge, too -- about 4 minutes, which really feels like a good deal after a 45-second charge. The Air Hogs Micro Terrain Titan is awesome in every way. It's cheap, great to look at, fun to drive, and a capable performer, and the run-to-charge time ratio is really high. All I want to do is get a big wooden table and build a detailed scale racing track with whoop-de-whoops, banked turns and little jumps. 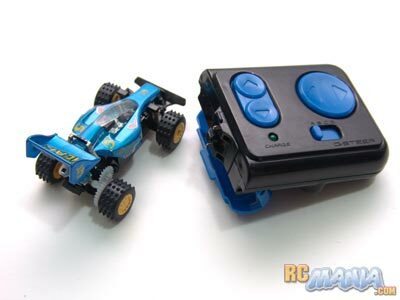 Oh, and I almost forgot to mention, the Micro Terrain Titans come in 4 different control "channels," which means if you get the right ones, four people can race side by side, at the same time. This car is a great deal and great fun. I highly recommend it for kids & adults alike!